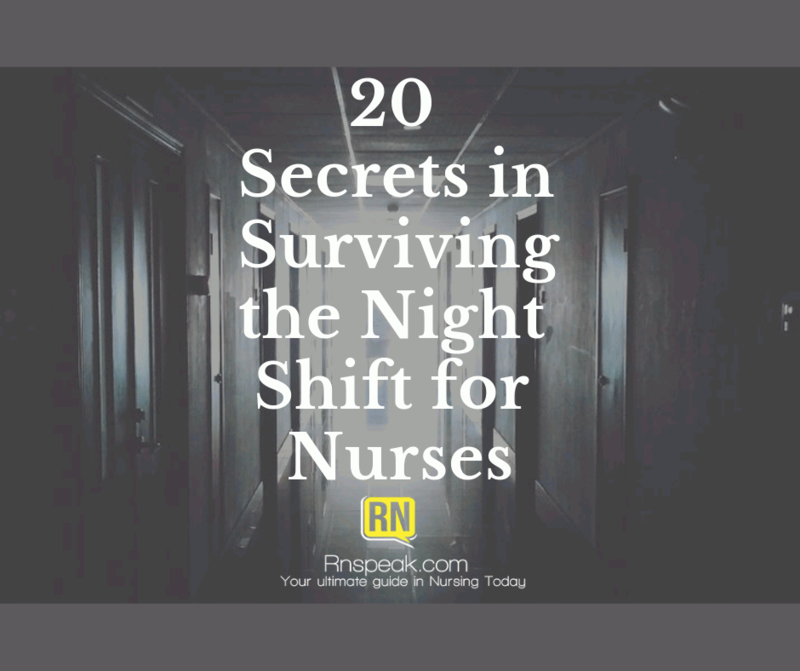 Surviving the night shift for nurses poses unique challenges in our personal and interpersonal relationships. Our work schedule dictates us nurses to make extreme adjustments to our lifestyle such as keeping ourself up and alert during night shift, and making significant changes in your daily routine and personal life. At the end of an 8-hour or 12-hour shift, a nurse usually goes home to rest while the sun is up high. Usually, we wake up just in time to attend to our personal life and report back to work. Night shift nurses complain about lack of sleep, depression, irritability, problems with focus, driving fatigue and general malaise, but this can be relieved by adequate rest and sleep. If you’ve worked as a night shift nurse, you know that implications of such working schedule. One should learn to adapt to a unique sleeping schedule that is unusual for the majority of the working population. If you’re a night shift nurse, don’t worry. You will be able to overcome these stresses and problems with the right planning and strategy. 1. Inform your household. Working the night shift asks you to do a lot of sacrifices. This includes seeing and spending less time with your family and friends. Provide the people you are living with your work schedule to avoid disturbing you during your sleep. 2. Know your schedule. This would prepare you mentally and physically for the different work schedule. 3. Sleeping schedule. Maintain the same sleeping schedule throughout your night shift even on your days off. You should have at least 7-8 hours of sleep in the morning. 4. Routine. Getting your body used to sleeping during the day and staying awake at night is the key to making sure that you feel “normal” when you’re working. 5. Drink your Vitamins. Doing continuous night shift could cause fatigue and malaise. Take vitamins to keep your body’s defense up and kicking. 6. Yoga. Provide yourself the peace and calmness of mind to be able made just decisions during your shift. 7. Be active. Most people would agree that staying physically active during these hours of the night would help in maintaining your alertness. Physical activity would include walking and stretching. 8. Keep hydrated. Drink at least 1 to 2 liters during your shift. Drinking water improves your circulation. It recharges your energy and allows you to be more alert. 9. Eat healthy. Adjust your meal schedule. Eat before going for your shift to gain the energy you need. Eat snack in between your shift. Don’t eat too much during your shift as your body uses the energy to breakdown the food. Avoid food high in sugar (chocolate and candies) 4 hours before your shift ends to prepare you for sleeping when you get home. 10. Caffeine. Caffeine (coffee, tea, and energy drinks) provides you the adrenaline you need to run your shift. Be cautious of your caffeine intake because studies show that it cause cardiac problems such as increased heart rate and palpitations. Avoid caffeine intake 4 hours before your shift ends to allow your body to reduce the adrenaline to prepare you for bed when you get home. 11. Positive attitude. Night shift can be cruel especially if you haven’t slept well during the day. Smile and always think that you’re helping and saving lives. 12. Adequate lighting. Provide yourself a well-lit work area. The bright light keeps you awake and allows you to survive the shift. 13. Wear bright colors (if possible). Color boosts your mood and that of the patients and families. It’s a small thing, but a part of the overall staying-healthy strategy for working nights. 14. Make yourself busy. The night shift is usually the most peaceful and quite shift because there aren’t much procedures to be done and the patients are sleeping. This is the time when you can do other tasks like restocking supplies, clearing the work area and preparing medications for the next day. You have to keep yourself busy to keep the energy at its level and avoid getting sleepy. 15. Know your co-workers. Engage yourself in a good conversation with your co-workers. It would keep you busy and let time seem fly faster. 16. Wear sunglasses. You should avoid exposure to sunlight because it triggers your body seem like its daytime. Less exposure to sunlight would also help you sleep faster when you get home. Wear dark sunglasses on your way home, if available. 17. Be home safely. Most accidents occur due to sleepy deprivation. If would be smart to carpool with another nurse when possible, and hold a conversation with the driver. When applicable, choose public transportation. If you insist on driving alone, increase the volume of the radio or leave the windows down. 18. Keep yourself healthy. Monitor your health and consult a doctor for any discomfort felt. 19. Conducive sleeping environment. You should try and eliminate noise and light in your bedroom. You can utilize the use of black out curtains and eye mask to mimic that night effect. Use ear plugs to cancel the distractions and avoid unwanted disturbance to your sleep. Put away your mobile phones and other gadgets that might tempt you in staying awake. 20. Find time for Rest and Recreation. Plan ahead your days off. Spend it with your family and friends and make it a point makeup for the lost time. Maintain a well- balanced social and personal life. During your days off make sure to make time to pamper yourself like treating yourself to the spa, a good meal or simple quiet time alone. For other profession, working the night shift might be an advantage because it frees up your day. It’s easier to attend to errands because you’re free during the day. Yet nurses deal with lives, that it demands us to be alert and coherent at all times during our shift. Working the night shift isn’t for everyone, but sometimes it’s a necessary evil. If you have to work the night shift, it’s important to understand the consequences that it can bring to your body, mind and relationships. To keep you alert, efficient during the shift and get home safely, getting a good rest is the key. With enough rest and sleep, and maintaining a positive lifestyle, serious complications would be avoided.